This entry was posted on Monday, August 3rd, 2009 at 17:42 and is filed under Cycling. You can follow any responses to this entry through the RSS 2.0 feed. You can leave a response, or trackback from your own site. 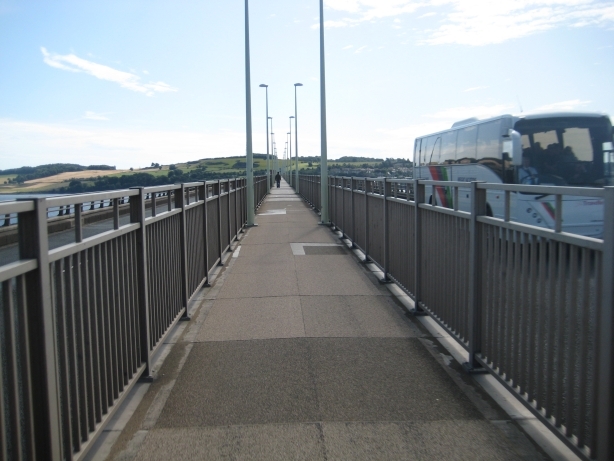 The Tay Bridge cycleway sounds interesting – I’m running in an event at Barry (near Carnoustie) on Friday, so I might bike across the Tay Bridge to Leuchars after it. You come round to just east of the bridge and turn into a service road. Skirt round the barrier and underneath one of the flyovers for a carriageway. The lift is there in the centre with a nice big NCR1 sign marked. At the southern end a subway takes you out to a car park on the eastern side and from there a cycleway leads you off to Tayport. Back at the northern end of the bridge there are some temporary fences in place at the moment. I suspect that you probably wouldn’t have had to skirt round the barrier in normal circumstances, but it’s the way to get to the lift at present. You wouldn’t be the person that mapped Carnoustie and Barry would you? I thought that the coverage looked rather good on my GPS this morning.